In certain quarries ore was mixed with coal slack and a process of “Calcining” which burnt the raw ore was carried out to drive off volatile material and reduce weight. This was particularly relevant when the ore had to be taken a long way and Burley Quarry, for instance, employed the method for its ore, which had to be taken to the Dorman Long steelworks in the North East. 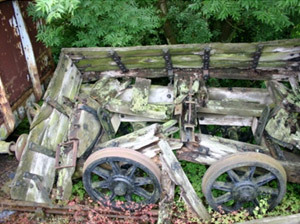 In many cases when the ore wasn’t burnt on the quarry floor, internal wagons were used to transport the ore from the quarry to the “cally banks”. These were often in the style of the older side tipping “ship canal” designs originating in the earliest days of railways. The Museum has an example of this type currently displayed in the central area (RRM 045). Later these were replaced with four-wheel steel skip wagons and we were able to preserve two rare examples built by G R Turner of Langley Mill in 1942, each having three transverse skips, these being lifted by a dedicated crane at the clamps. They were often used for delivery of coal to the calcining operation where layers of coal slack were mixed with the raw ore.